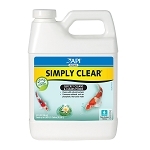 Chlorine and Heavy Metal Neutralizer from the POND CARE division of Aquarium Pharmaceuticals is a must for all pond keepers setting up a new pond or performing Spring maintenance. PondCare CH&MN instantly neutralizes chlorine, copper, lead and zinc as well as other heavy metals found in tap and well water. These elements can be toxic to fish and plants. Use every time you add water to start or maintain a pond. The 16oz bottle treats 9600 gallons, The 8oz bottle treats 4600 gallons.16oz 9200.